Figures from the latest ONS survey of Adult Smoking Habits in Great Britain were released today and Hazel Cheeseman from ASH UK and Prof Peter Hajek from Queen Mary University of London were interviewed about the findings. 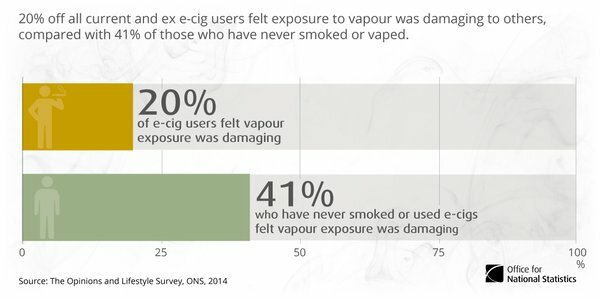 2.2 million people in the UK are now vaping, and this is the first time the figures on the use of e-cigarettes have been included in this survey. The data tables can be found here, and there’s overviews of the figures both here, and here in a slide share. The less encouraging figures are that there is still large numbers of smokers and non smokers who don’t realise that the relative risk of these products is far, far less than smoking, and Clive Bates has touched on this in a post today. It is extremely unfortunate that the industry is explicitly prohibited from promoting the use of vaping for cessation and harm reduction, while the Health Service Executive and anti smoking charities and bodies could – but do not. This is despite ever increasing evidence from elsewhere in the world, and particularly England, that this is exactly what they should be doing. Failing to do so only increases the burden of smoking related illness not just on the Irish healthcare system, but also on ordinary people and their families.